“Help! There’s a monster in my closet!” Marley gasped, panting for breath. “Oh? What did it look like?” His mother asked. “It had three eyes and red scales!” Marley exclaimed. He waved his hands in the air to show her how big it was. “You do?! Well… no I didn’t. Wait? What do you mean you have a monster? !” Marley blinked, confused by his mother’s reaction. He wasn’t sure if he was more taken aback by her having a monster in her closet, or the fact that she knew its name. She was as unmoved as if he had told her he found a caterpillar in his room. Weren’t they supposed to run away screaming, or burn the closet down or call the police? “Yes – Alzarine has nine blue tails and wings like a bat. Why didn’t you ask it for its name?” She asked matter-of-factly. “So it might eat me!” He thumped his fists into the kitchen counter. “Did it hurt you last time?” His mother asked as she got eggs from the refrigerator. “Well… no.” He muttered at her back. “Then you’re scared? I thought you were brave.” She closed the fridge door and looked at him in mock disappointment. Marley stomped back up the stairs and sat in front of the closet. He stared at the door for several minutes. Then he took a deep breath and cracked the closet door open with the tiniest of slits. A needle of light fell upon the monster, and it slowly opened all three eyes. Marley screamed and slammed the door. He leaned his back against the door to prevent the monster from getting out. “Wh… What’s your name?” Marley asked nervously. Marley’s eyes widened and barely managed to eek out, “Marley!” before he scrambled out of the room and bolted down the stairs. “Mom, I saw the monster again!” He panted. His legs felt like noodles and his arms were covered in goosebumps. “Did you ask for its name?” She asked, putting the eggs in a boiling pot of water. “Yes – it’s Salazar.” Marley straightened himself and tried to regain his breath. “Ah – that’s an interesting name. My monster likes to blow bubbles. What does your monster like to do?” She looked up at him expectantly. “Well, I don’t know. I didn’t ask.” He blinked. “Why don’t you go ask?” She urged and waved him out of the kitchen. “Ok… I’ll try…” Marley trudged up the stairs. His heart was heavy with dread. He didn’t want anything to do with the monster. Marley sat in front of the closet again. “So… What do you like to do?” He asked. Silence. Marley inched closer. “Salazar?” Still silence. Marley slowly opened the closet door a bit wider this time and held his breath. He saw the three eyes blink. “I like to stargaze.” The monster crooned. “What about you?” Salazar leaned close against the crack and its hot breath made Marley turn away. Out of the corner of his eye, Marley could make out a tall, scaled, giraffe-like neck move from side to side like a serpent. Marley shut the closet door. “I like dra… drawing.” He stuttered. Then before the monster could say anything more, he zoomed out of the room and back into the kitchen. “Mom, I saw the monster again!” he shouted. “Did you ask it what it liked to do?” She looked up from cracking eggs. “Yes, it said it likes to… stargaze.” He hesitated, unsure why such a scary looking monster would care to stargaze. “I don’t know!” Marley sighed in frustration. “Then maybe you should…” she started. “… Go ask. I know. I know.” Marley interrupted, annoyed. He went back upstairs. Marley stood in front of the door and crossed his arms. Then he had an idea. He opened the closet door, dove under the bed, and waited. Nothing moved. 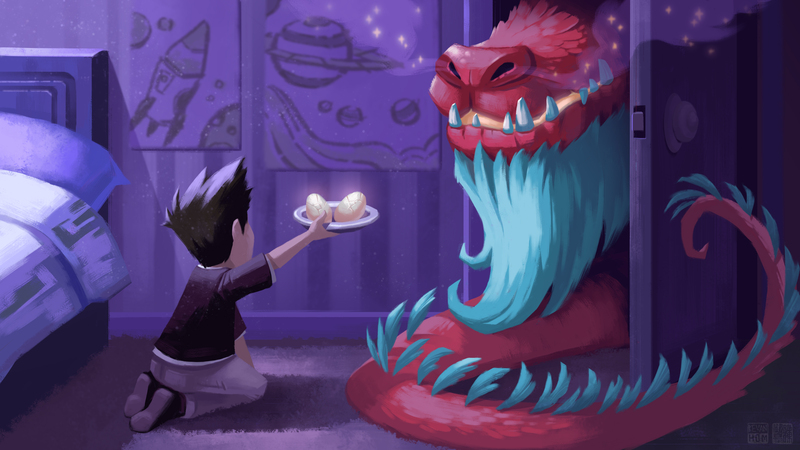 “Salazar…what do you like to eat?” He finally mustered the courage to ask. Marley poked his head out from under the bed. “I do too! Mom’s making some tea eggs right now.” The serpent didn’t seem to be that threatening, so Marley climbed out. Salazar blinked at him. “What are tea eggs?” Marley stood on top of the bed to be eye level with the monster. Its three eyes reminded Marley of ruby gemstones. “They’re good. Wanna try?” He offered. “Ok. I’ll be right back!” Marley rushed down the stairs. “Well?” His mother asked, raising an eyebrow. “How perfect – they just finished cooking.” She ladled the cracked eggs from the dark liquid and peeled off the shells. Spidery veins of brown were marinated into the egg whites and reminded Marley of dinosaur eggs. He brought two eggs in a dish upstairs. “Here Salazar – try the tea eggs.” He placed the dish in front of the serpent. Marley scooted in to eat the other egg. “My mom says that they are marinated in soy sauce, black tea and five star spices.” He looked up, wondering if Salazar ever needed to chew. Salazar chuckled. “What’s so funny?” Marley asked. Marley laughed too. Salazar was funny. “Wow! You can breath fire? Can you show me?” He jumped onto his bed in excitement. “I could, but I may accidentally burn those posters down. Did you draw those?” Salazar nodded at the two posters tacked onto the wall. “These are very creative. You have a gift, my young space cadet.” The serpent studied the drawings carefully. “Thank you,” Marley blushed. “Do you have a favorite constellation?” He asked, curiously. “The Serpens Caput,” Salazar responded without hesitation. “They say we dragons were born from the Alpha Serpentis – the constellation’s brightest star. Would you like to see? I can show you.” Salazar boasted. He gestured for Marley to climb onto his back. “Show me? As in… you can fly?! But you don’t have wings.” Marley protested in disbelief. Salazar nudged open the bedroom window. “I don’t need wings to fly. Wings are for amateurs.” He huffed. Marley wondered if his mother’s monster would take offense to that. Salazar stuck his head out the window. “Maarrleeeey – dinner is ready!” His mom called from downstairs. “I’ll be down in a minute! Salazar and I are gonna go watch the stars together!” Marley called back. A cool and refreshing breeze billowed up the window curtains. Marley climbed onto Salazar’s back. They looked at each other, nodded and launched off into the twinkling night sky of the northern hemisphere. Back in the kitchen, his mom smiled and sat down to eat a tea egg. “Well, I think overall Marley handled his birthday present rather well, don’t you?” She looked over at a pair of bat wings sticking out from behind the couch. Bring eggs to room temperature by taking them out of the refrigerator for several hours. Meanwhile, in a large pot, combine the 4 cups water, black tea bags, soy sauce, sweet soy sauce, star anise, salt, brown sugar, Sichuan peppercorn and five spice powder. Bring the mixture to a boil and simmer for 10 minutes and then turn off the heat and let it cool completely. Bring another pot of water to a boil and gently lower the eggs in with a spoon. Boil the eggs for 7 minutes. Remove the eggs from the boiling water and place into a cold water bath to stop them from cooking. Once the eggs have cooled, gently crack the eggs using the back of a metal spoon. 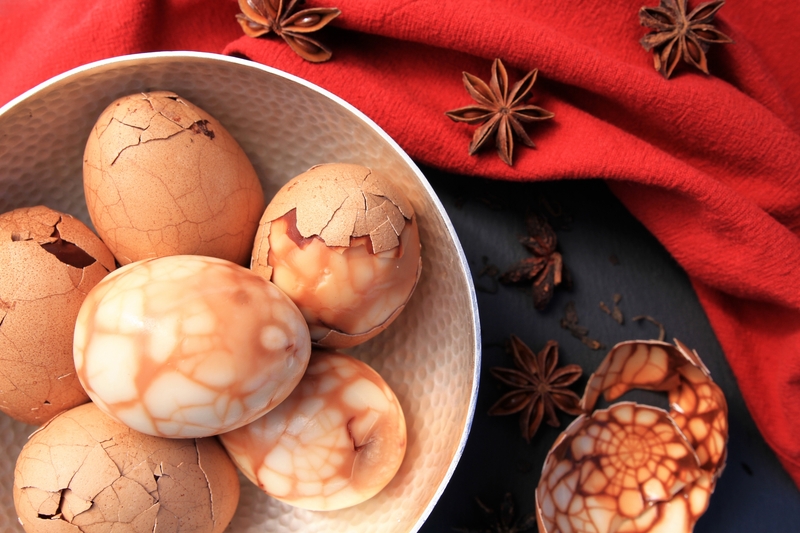 This is the hardest part of the recipe because you want to crack the eggs just hard enough to create deep cracks for the sauce flavor to seep in and marinate the eggs, but not so much that the shell comes apart. Soak the cracked eggs in the tea marinade for at least 24 hours (or up to 3 days) in the refrigerator depending on how strong you want the flavor to be. After 24 hours, peel the eggs and enjoy. Other variations to try include adding combinations of dried mandarin peels, cinnamon sticks, bay leaves, pieces of ginger, Tamari soy sauce and Shaoxing wine. 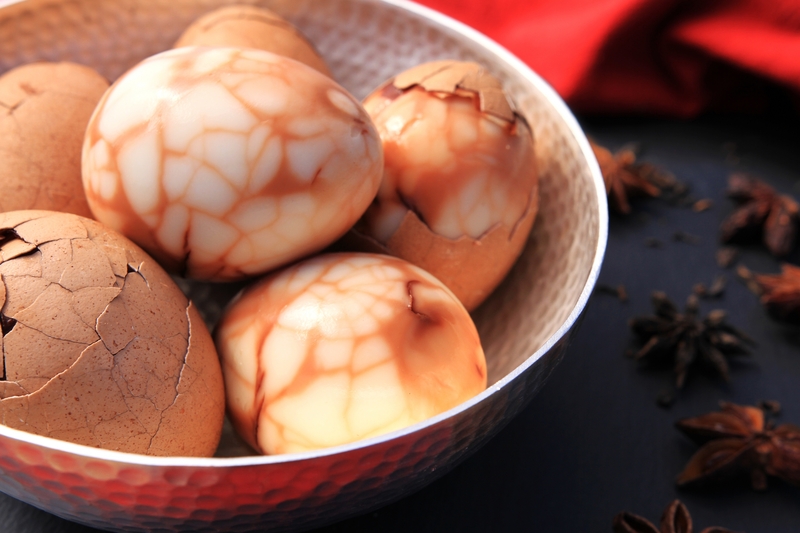 Tea eggs originated from China, but variations of it can be found in other Asian countries such as Taiwan, Singapore, Indonesia and Malaysia. They are commonly sold by street vendors in night markets, or sold in convenience stores and restaurants to be eaten as a snack. I grew up eating tea eggs. While I’ve always thought the crackly marinated pattern to be cool and other-worldly, it was as normal a salty snack for me as string cheese was for other kids. Besides being cool, it is simple to make and is a convenient healthy protein snack. I just had to share it in a story. Great story! I was so pleasantly surprised that the monsters were kind creatures! It reminds me of how I can make friends with my own mental chimeras. And I love how how you incorporated a Chinese recipe! I love it. Thank you! Super fun story……..wish I had a dragon in my closet 😊.